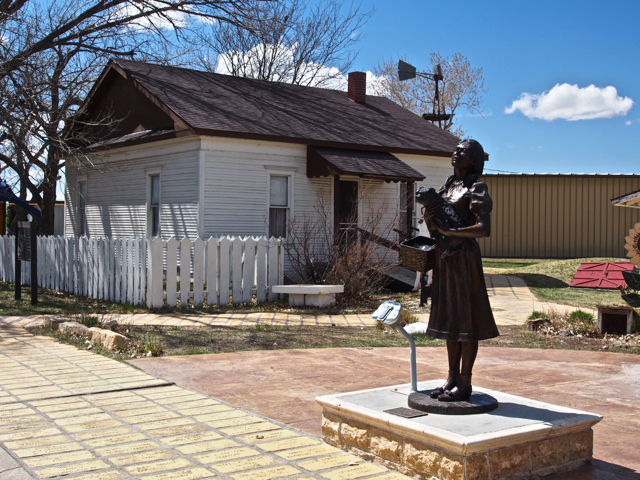 On Monday, I stopped at the home of Dorothy and Toto in Liberal, Kansas but they were out for the day. 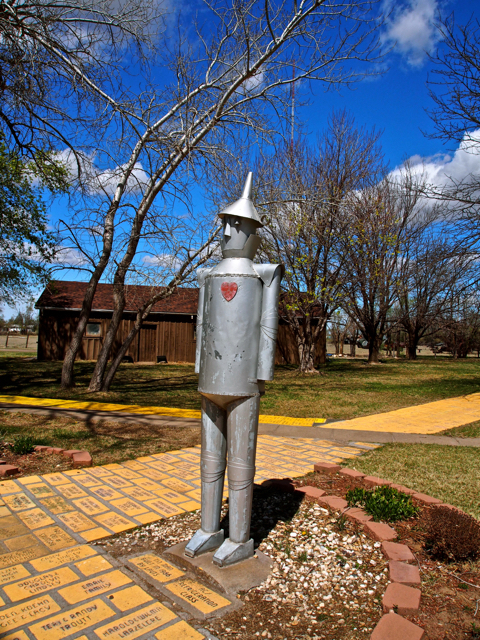 So I walked around their house on Yellow Brick Road and met the Tin Man and saw the root cellar where the family ran to safety during the tornado. Later that day, the sky looked ominous. Strange, dark menacing clouds. I think my perception of Kansas is still tainted from watching the Wizard of Oz for the first time as a very young child. Since that movie, I grew up thinking that tornadoes lived in Kansas and were always catching people unawares. I was certainly being vigilant. Driving up US 83 North the next day, the Cattle Belt of America; there were feed lots everywhere, I came to the town of Oakley where I stopped for fuel. In the 10 years that I have been on the road, the routine has always been that first I pay for the gas, then I fill my tank. Well, this time the lady at the counter said Just go out and fill your tank then come back in and pay. I stuttered an okay and went out to the gas pump. When I returned to the counter and paid for my fuel, I told the lady that in my years of traveling, this was the first time anyone has ever trusted me to pay for the gas after I get it. She made my day. And we made each other smile. And with a smile, I will always remember Michaela at Casey General Store in Oakley, Kansas. This entry was posted in Uncategorized and tagged AMERICANA, HOME ON THE ROAD, Road Trips, tincantravelerPhotos. Bookmark the permalink. What a great place and a wonderful find. Such wonderful adventures you always have. At least the sun is out in the pictures. That is calming. Have a wonderful trip. Looking forward to more. Yes, you can see all this in stories and pictures on the internet and TV but experiencing it all in person is a whole new world of sights, sounds, aromas.